The far flung, exotic shores of Themyscira bid us once again my Amazon loving affiliates, as we continue our weekly comic cover countdown to the 75th anniversary of Wonder Woman. This week we emerge from the depths of the Amazon archives with; Wonder Woman (Volume 2) #124. Written and illustrated by John Byrne, with cover art by Jose Luis Garcia-Lopez. Released in August 1997. This weeks tantalising tale is titled “All My Sins Remembered” and follows Diana and Artemis as they continue their descent into Hell to confront the demonic Neron, it is here that the amazing Amazon will face her greatest challenge and her ultimate tragedy. This issue also presents us with two generations of Diana’s celebrated consort Wonder Girl, Donna Troy whose origin we covered in an earlier episode, and the most recent and current holder of the title, Cassandra Sandsmark. 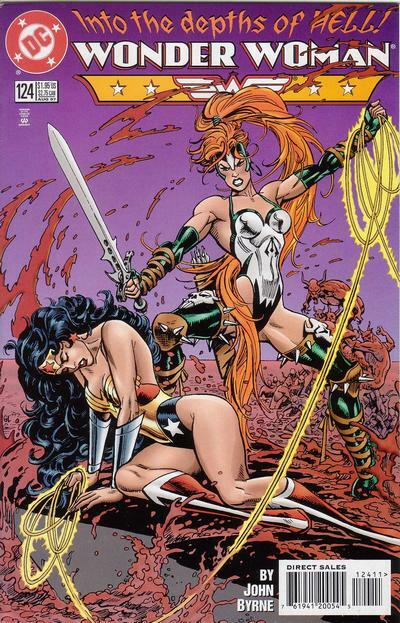 Cassie was created by John Byrne in 1996, and made her first appearance in Wonder Woman (volume 2) #105. 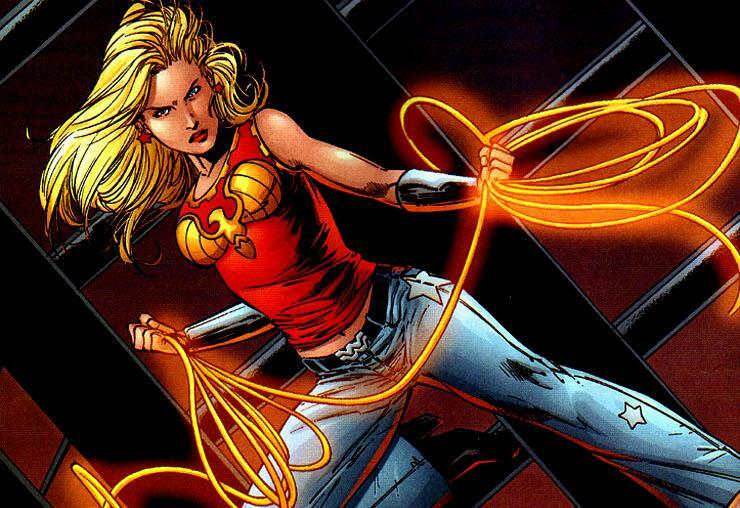 She was first introduced as the daughter of archaeologist Helena Sandsmark, who discovered magical artifacts that bestowed super powers to her daughter, which she subsequently used to fight crime as the new Wonder Girl. It was later revealed to her that she was in fact a demi-goddess and the daughter of Zeus himself. 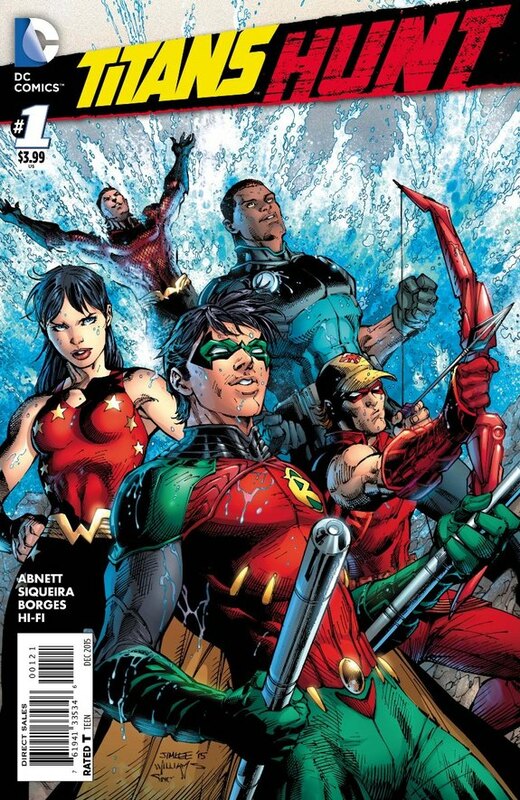 In 2011, DC relaunched their universe as the “New 52” to re-establish a new continuity for their characters, essentially a massive reboot with many characters having their back-stories retold and in some cases changed entirely. With Wonder Woman’s origin completely revised so that she became the daughter of Zeus, Cassie also underwent a complete revision of her roots. Re-introduced in the pages of Teen Titans as a super powered thief with demonic infused bracelets, she is inducted into the team of teens by Batman’s ex-protege, Red Robin. 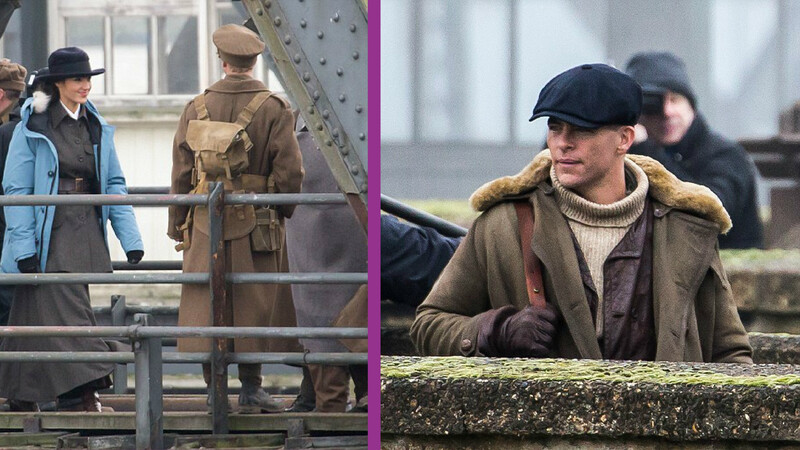 It is later revealed that she is the niece of Wonder Woman and the daughter of Lennox Sandsmark, Diana’s half brother. 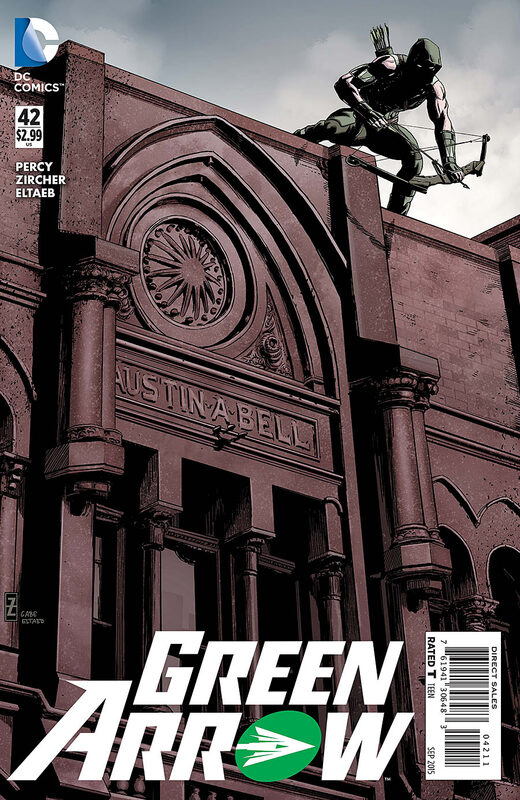 New comics Wednesday is upon us once again, my comic collecting cohorts, and this weeks cover highlight is; Green Arrow #42, depicting everyone’s favourite emerald archer stalking the rooftops of Seattle. Oliver Queen is more popular now than he has ever been thanks to an influx of new fans through the rather splendid “Arrow” television series, and his “New 52” reboot series has also been a sterling triumph for DC Comics, containing great character development, engrossing storylines and notable artwork. 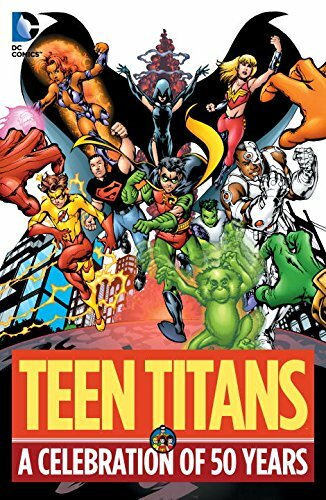 July also heralds the beginning of DC’s “Teen Titans GO” variant cover month, with a handful of their monthly titles (including GA #42) shipping with alternate covers depicting the popular cartoon network show that stars Robin, Batgirl, Starfire, Cyborg, Raven and Beast Boy. The show itself is known for its cheerful and humorous tone and is a fun watch for comic fans of all ages. Green Arrow #42 is available at your local comic-book emporium right now. Written by: Benjamin Percy. Cover and Interior art by: Patrick Zircher. Variant Cover by: Craig Rousseau. 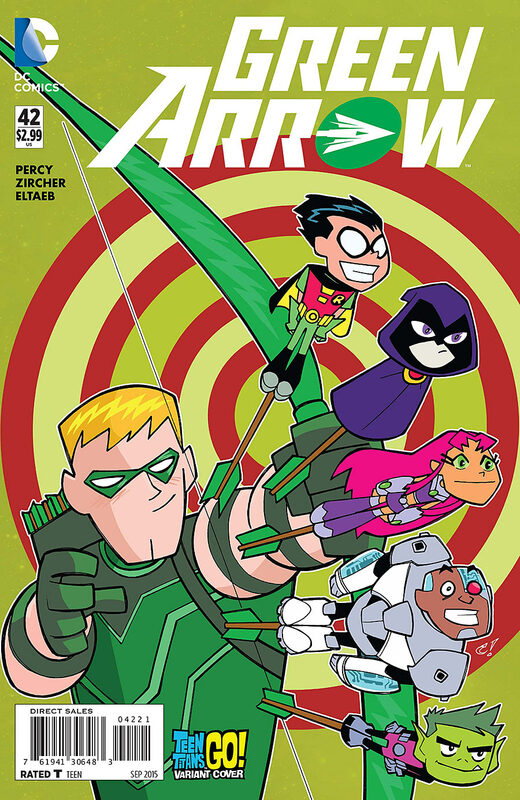 Tags: Comic Cover Of The Week, DC Comics, Green Arrow #42, Oliver Queen, Teen Titans, Teen Titans GO! 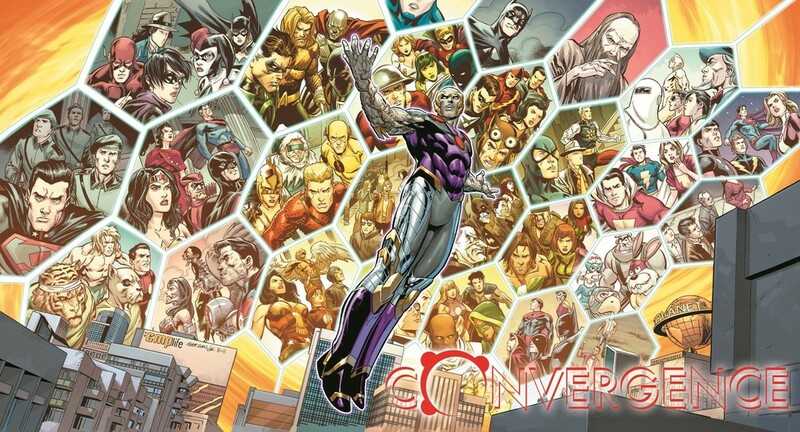 This weeks captivating comic cover is; Convergence: New Teen Titans #1, this particular issue has a real nostalgic resonance for me, starring my personal favourite line up of this classic super team. 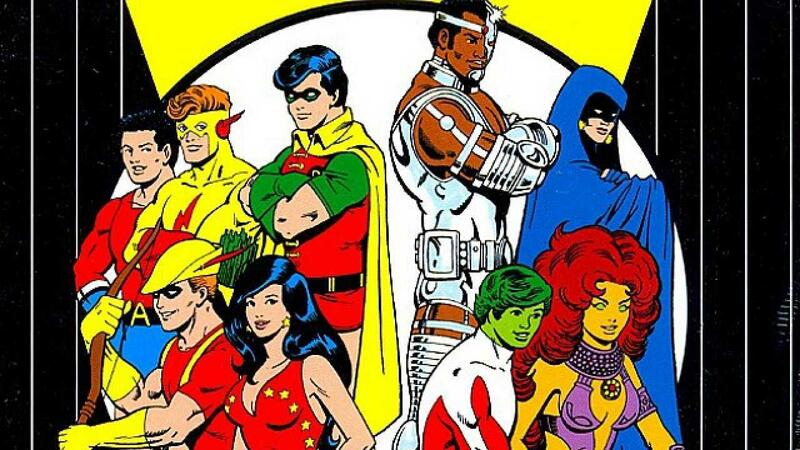 A return to the mid 70’s version of the Teen Titans, Nightwing, Starfire, Cyborg, Donna Troy and Beast boy, the heroes of Crisis on Infinite Earths, come together to take on the Tangent Universe’s Doom Patrol. The amazing cover is drawn by one of my favourite artists of all time, the fantastic Nicola Scott, and is written by the legendary Marv Wolfman, this is certainly an issue no DC fan should be without! 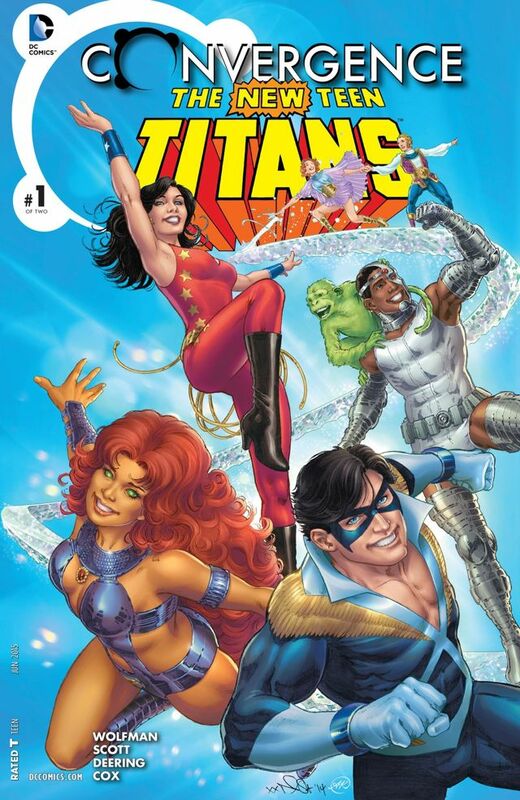 Convergence: New Teen Titans #1 is available from your local comic book emporium right now. Written by: Marv Wolfman. 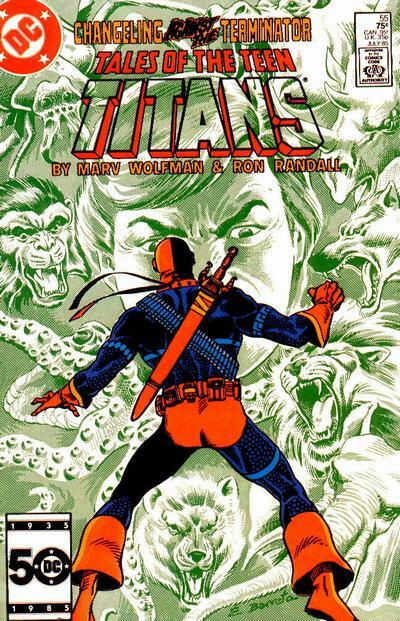 Cover and interior art by: Nicola Scott and Marc Deering. Variant cover by: Chip Kidd. 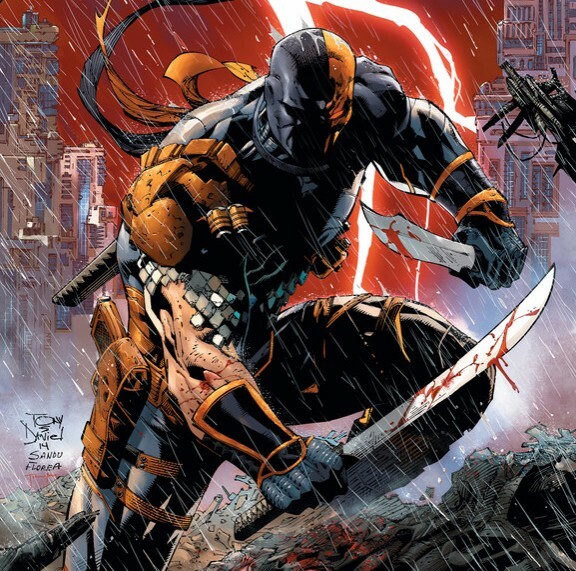 Super-Villain Sunday this week brings you the original Terminator himself, Slade Wilson, aka Deathstroke. 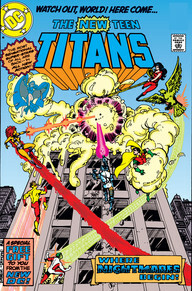 Created by Marv Wolfman and George Perez in 1980, making his first appearance in The New Teen Titans #2. Slade was originally an officer in the US armed forces, who towards the end of his military career volunteered for a dangerous genetic experiment that was designed to increase brain capacity and create a super soldier. The experiment however was rejected by the military and deemed an overall failure, due to most of the subjects dying or being left in a vegetative state, Slade was amongst them. 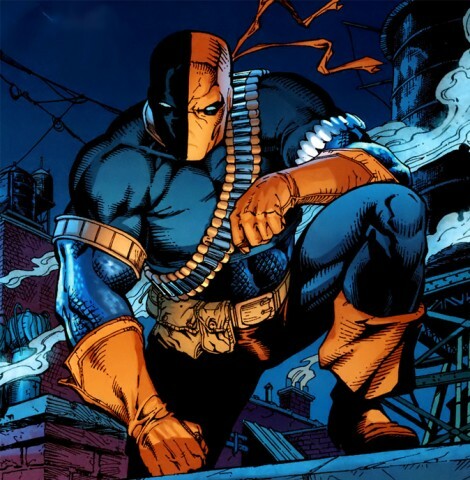 Unbeknownst to the Army, Slade’s strength, agility and brain capacity had increased exponentially, and after being discharged honourably by the Army, he recuperated and became the costumed mercenary/assassin, Deathstroke. Originally created as a villain for the Teen Titans, battling them on many occasions over the years, he would eventually branch out, becoming a major adversary for both Batman and Green Arrow. Slade’s iconic two-tone mask hides the fact that he lost an eye during a military incursion in his former life as a soldier, this would usually affect the performance and visual acuity of a normal human, but with Slade able to access 90% of his brains capacity, this impairment is not noticeable to him. 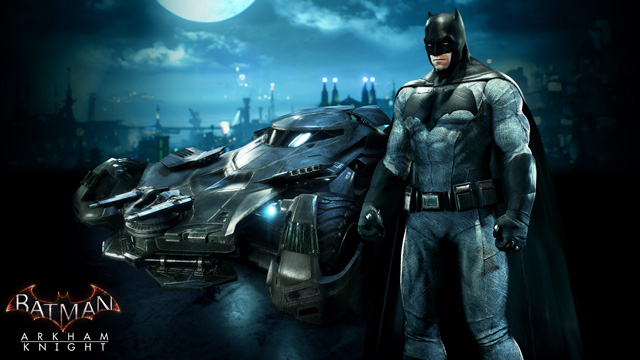 In the past few years, Deathstroke’s popularity has exploded, with his inclusion in video-games such as Arkham Origins and Injustice: Gods Among Us, and also the popular television series, Arrow. With DC Comics cinematic universe unfolding on the silver screen over the next few years, comes the very real possibility of seeing everyone’s favourite merc-villain appearing on the big screen as an antagonist to at least one of DC’s heroes, in fact, I would not be at all surprised to see him pop up in at least a cameo role in the 2016 Suicide Squad movie, seeing as he is one of the squad’s most famous on/off team members. Super-Villain Rating: World’s Most Dangerous Mercenary. Deathstroke Required Reading Recommendations: Identity Crisis. 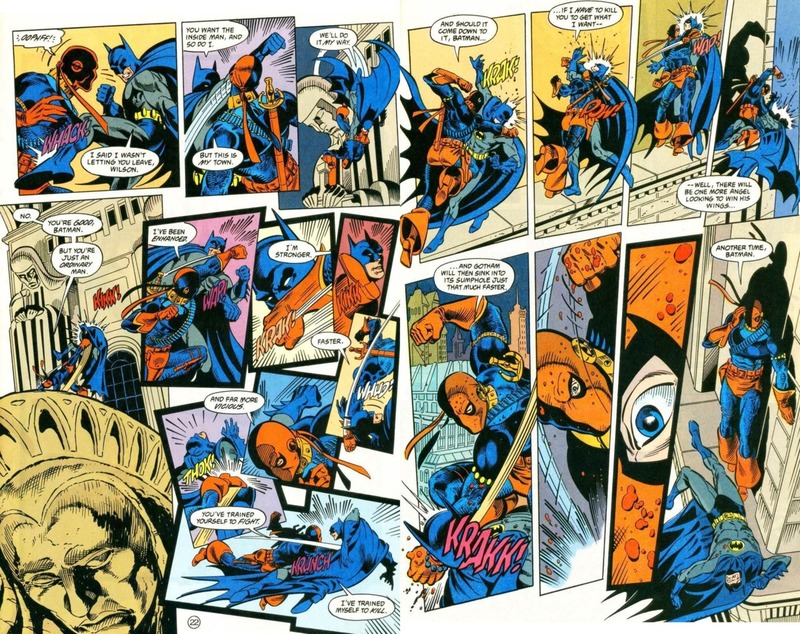 Deathstroke: Legacy. 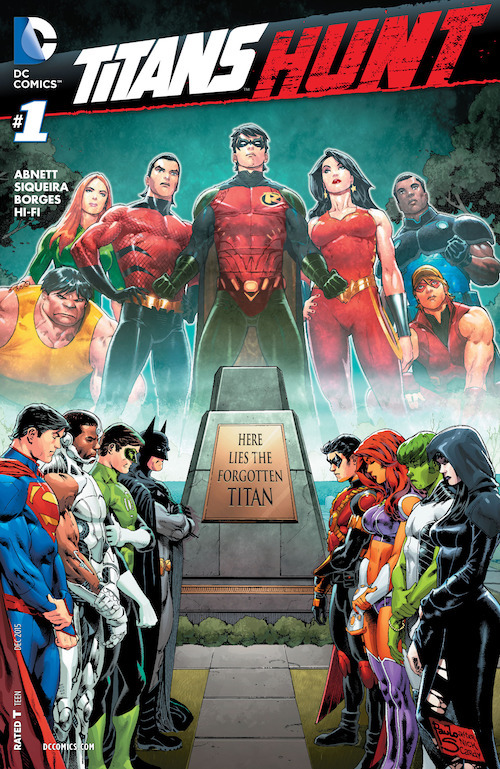 The New Teen Titans: The Judas Contract. 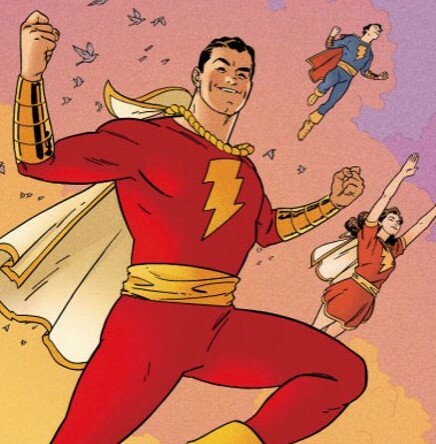 Welcome fellow fans of capes and cowls to another instalment of, Comic Cover Of The Week. We are again focusing on the movie-variant covers that DC are producing throughout this month in recognition of its parent company, Warner Brothers celebration of 100 years of film production. 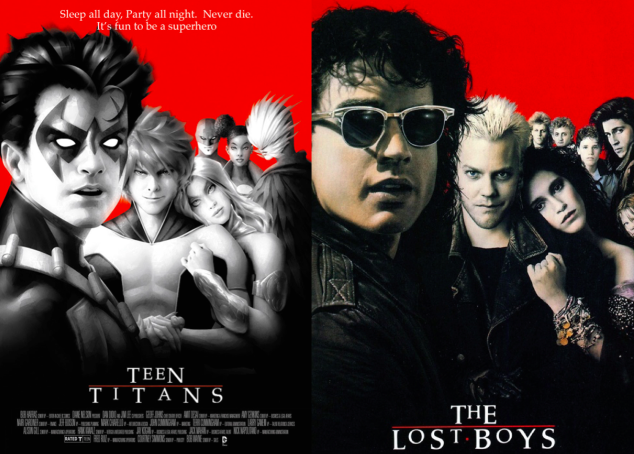 Taking classic movie posters and melding them with popular Superheroes, this weeks cover pays homage to Precinct1313’s all time favourite vampire movie – The Lost Boys, merged brilliantly with one of comics most popular super-teams – The Teen Titans. 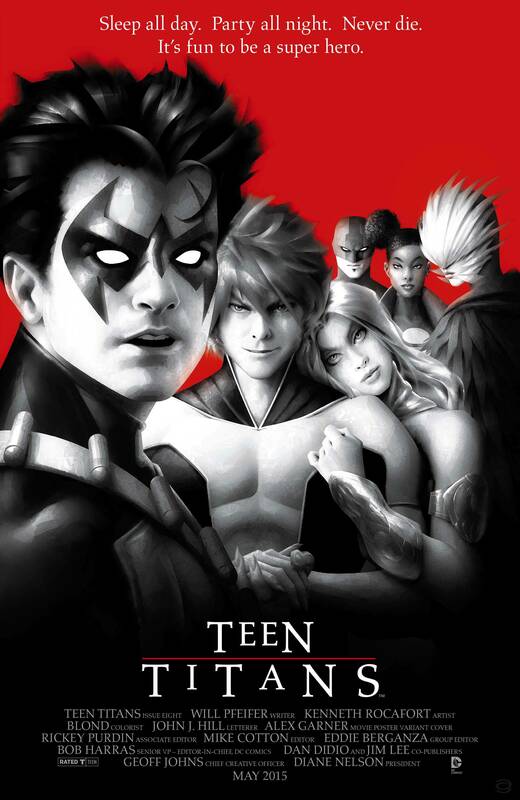 The Teen Titans movie variant cover is available at your local comic-book emporium right now. Written by: Will Pfeifer. Cover and interior art by: Kenneth Rocafort. Variant cover by:Alex Garner. We Love Kotobukiya – #2. We love Starfire here at Precinct1313, she is one of our favourite female superheroes..(no.9 in our top 15 characters of all time 1313 fact fans), so allow us to share these pictures of the awesome Kotobukiya statue of the adorable alien Princess. 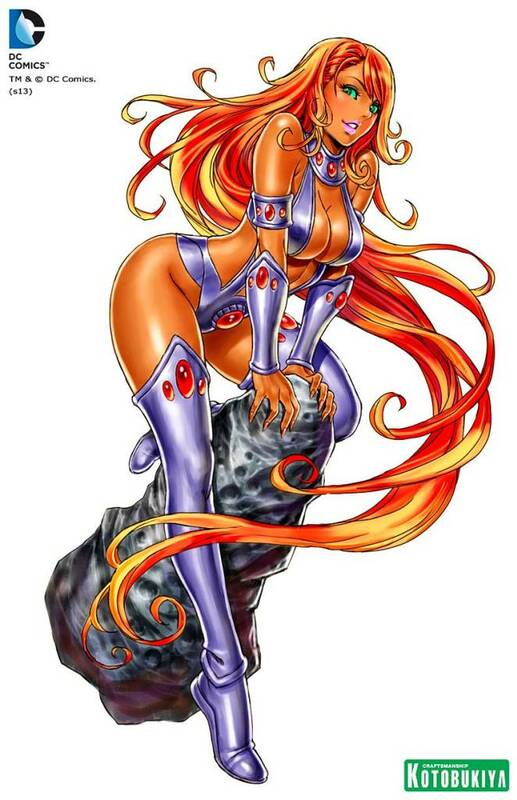 This fantastic version of Koriand’r of Tamaran was originally envisioned by Japanese artist Shunya Yamashita, and the statue is an amazing rendition of his original design by sculptor Toshiaki Hogari. 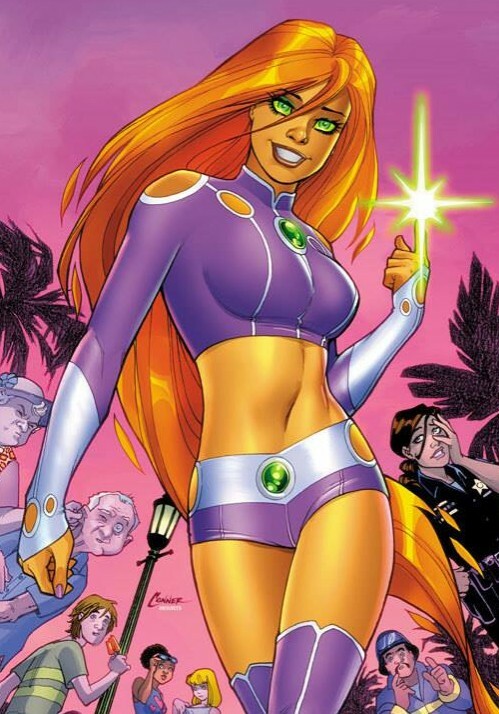 Standing at 1/7 scale, just over 8 inches in height, Starfire exudes beauty..from the intricately designed and beautiful face replete with her gorgeous bright green eyes to the the long flowing red hair, this statue encapsulates everything we adore about the one time Teen Titan heroine. The release date for the statue is tentatively put as sometime between September and November, which means we can add this to our Xmas present list along with the dozens of other toys and figures we need in our lives!